For a week, a massive wildfire has caused serious damage in Canaima National Park. 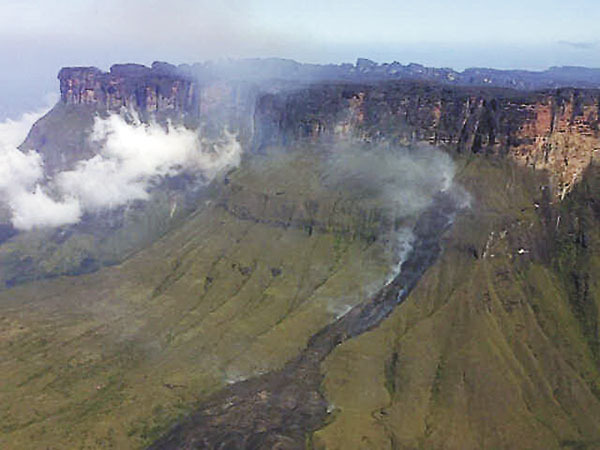 This recent photograph from the newspaper Correo del Caroní shows how the fire has now reached the Auyán-tepui. The news report indicate authorities on the ground lack the elements needed to fight it and the Venezuelan air force doesn’t have in its fleet aircrafts for this particular task. The government considered buying some Russian Beriev Be-200 planes back in 2010, but looks like they spent the money in armored vehicles and missile systems instead. But when the wildfires happen in allied nations like Ecuador, we lend them our helicopters. The current situation in Canaima is the latest in a series of wildfires that have affected the country in the first trimester of this year: From the Henri Pittier Park in Aragua to the Avila in Caracas, and even here in the Turbio Valley located next to Barquisimeto, the dry season is already taking its toll on our enviroment, through the rapid increase of wildfires. The Venezuelan park authority (INPARQUES) released yesterday a press statement, where they report the Canaima wildfire is now under relative control.